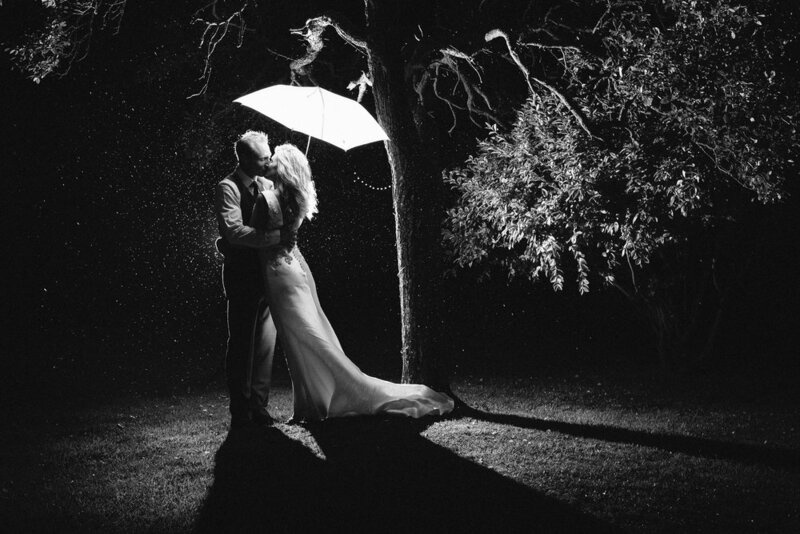 Can you still get amazing photographs even if it rains on your wedding day? Yes, you can still get amazing photographs even if it rains on your wedding day. After a baking hot summer, it was inevitable the weather would break eventually, and on the weekend where I had three weddings in close succession, the rain began. At Zoe & Ed's Yorkshire wedding we had scheduled a sunset bride and groom portrait session but the cloud was low and the skies were the colour of television, tuned to a dead channel. We picked things up later in the night when the rain was falling freely, and I'd broken out my strobes to light the scene. Speaking of strobes, it's probably worth saying that I have completely changed my flash setup for this wedding season. Back in 2016 I sold off all my Canon gear and bought Fujifilm mirrorless cameras. The X-Pro2 in particular has become a key part of my photography, and I love it because of it's rangefinder ergonomics, the quality of images it produces and because it is small, discreet and lightweight. My Canon speed lights, along with Yongnuo triggers, were all compatible with my Fujifilm cameras, so I continued to use them. I'm not one for spending loads of money on gear unnecessarily - I'd rather work with what I have until it becomes an impediment to what I want to achieve. At that point I can invest in gear that I know I will use and actually meets my needs, rather than being a shiny new gadget I buy on impulse that ends up covered in dust at the back of a drawer. I found the Canon and Yongnuo set up was bulky and heavy though, and after a wedding last year at the Vermont Hotel in Newcastle, where I had to walk up Dean Street at the end of the night with all of my gear, I vowed to streamline my equipment. I don't use a massive amount of flash at weddings, mostly I work with the ambient light. Occasionally I'll use it on cake cutting and first dancing in dark venues, and always on the dance floor where I get creative and drag the shutter. Every now and then I use off camera flash for night portraits, which Is what I did for Zoe and Ed. After some detailed research I settled upon the Godox system, and bought a TT350F, which is designed for use with mirrorless cameras. This little flash unit is half the size of my old Canons, and while it doesn't have the same power as them, it serves my needs perfectly for a wedding day. I quickly purchased a second TT350F, and as they have triggers built in, it meant I had the ability to utilise both on camera and off camera flash. Anyway, back to Zoe and Ed's nighttime portrait in the rain. Zoe had strung lights up around her farm on the wedding day, and we chose a spot in her front garden under a tree as the backdrop to the photo. I popped the little Godox on a light stand at a height of about 3 feet, set back around 10 feet from the couple. I angled it to shoot forwards to me and up slightly into the tree at around half power. I attached the second Godox to my camera and used it as a trigger to fire the off camera flash. The umbrella looks good in the photograph, but was also a necessity because it was chucking it down and Zoe used it to keep dry to get into the right location. It's a Westcott shoot through umbrella, which meant the light could pass through it to help illuminate the tree but a portion of the light would also be reflected down onto Zoe & Ed's faces. So, the moral of the story is don't be downhearted if it rains on your wedding day. Take 5 minutes to get out into the rain and make some magical portraits that you'll treasure for the rest of your life.